Sanders introduced a bill in the US Senate on Wednesday September 13, 2017 that would provide “cost” and “services provided” efficient “Medicare for All.” 57 percent of Americans support Medicare for All, according to Kaiser Health News. Fifteen Democratic Party legislators support the bill, which is up from 1 (Sanders) a few years ago. Fifteen Democratic Party legislators support the bill, which is up from 1 (Sanders) a few years ago. 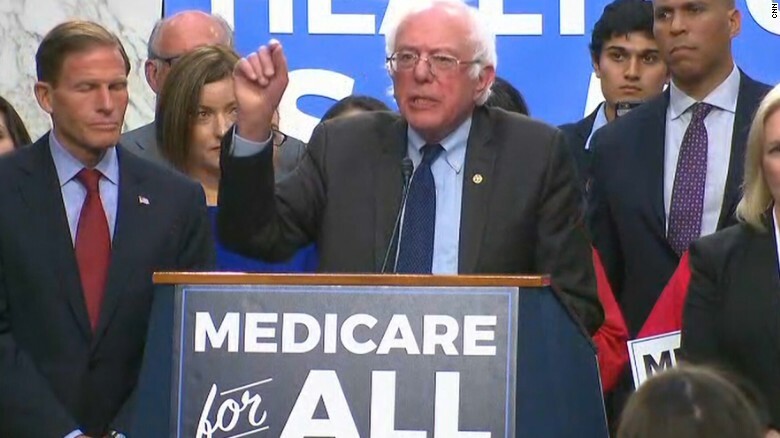 “Medicare for All,” but that’s more of a handy slogan than reality, as this plan would greatly expand Medicare and overhaul it — for example, it would greatly expand the type of coverage offered and also eliminate deductibles. Under the current US system, premiums, copays, and deductables have constantly increased for decades, long before Obamacare came into being. Medical services have been cut back, even as costs (and profits) have risen. Much of this cost increase (if not all of it) is so publicly traded limited liability health care corporations can increase profits, which tend to push up share prices and dividends. 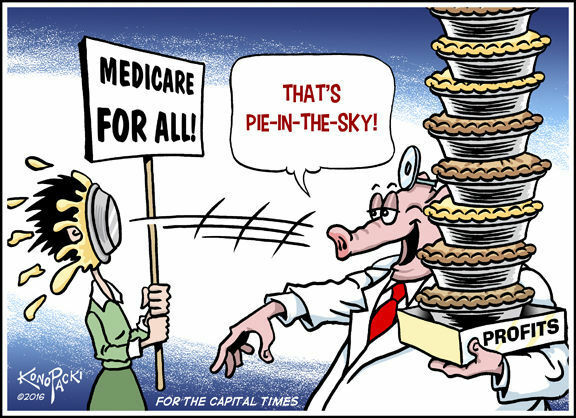 In effect, health care provided by publicly traded corporations is really an income redistribution scam perpetrated on the 99 percent by shareholders of the 1 percent. Such corporation distort the market through collusions. Sanders plan would be phased in over four years and would cover more things than Medicare currently does. His plan would cover dental and vision care, for example, which are for the most part not covered by Medicare. The cost would, obviously, be less expensive and more efficient than the profit motived health care system we now have in the United States. The rich are about to win politically again through their corruption of the federal government. President Trump has wasted no time in taking aim at the Affordable Care Act (ACA), otherwise known as Obamacare. Joint research from the Urban Institute and the Robert Wood Johnson Foundation show up to 30 million Americans may lose their healthcare coverage if the ACA is repealed. For high-income investors, however, the end of Obamacare could bring a financial windfall. Rebecca Lake of Investopedia.com points out that individuals earning over $200,000 and couples filing jointly and earning over $250,000 a year pay an additional 0.9 percent Medicare tax helping to fund the ACA. In addition, another “provision is the 3.8% net investment income tax. This tax applies to capital gains on investments and it follows the same income thresholds as the additional Medicare tax.” Capital gains is money earned through the sale of assets, such as stocks and bonds. Repealing Obamacare would put significant amounts of money back into the pockets of the rich, who would then use their newly created windfall to pump more money into the current stock market bubble, blowing it up even more and blowing away the economy much more severely when it explodes, as well as use the funds to corrupt government even more in their favor. The rich already own the entire Republican Party, and most of the Democratic Party. “An analysis by the Center on Budget and Policy Priorities has found that millionaires would stand to get an 80% tax cut if the additional Medicare tax and the tax on net investment income were to disappear. The average tax break for those earning more than $1 million annually would total just over $49,000.” The 400 biggest income earners would receive a tax cut of over $7 million each. That would be a tax cut every year for infinity for the folks who have corrupted both major political parties and rigged the economic and political game in their favor. 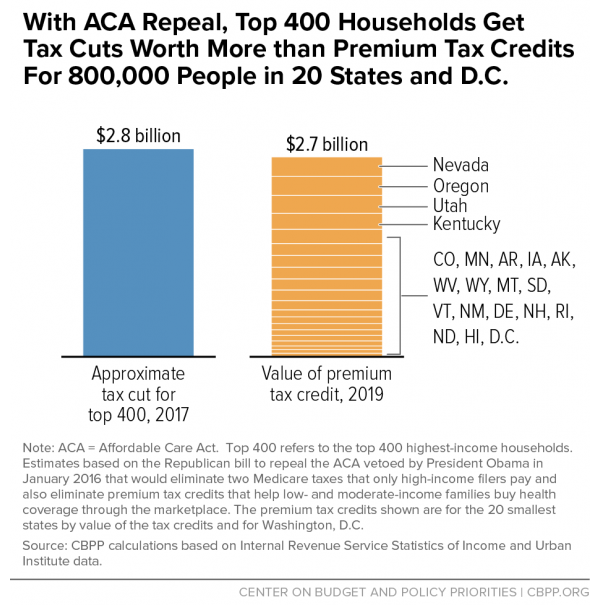 No doubt, any replacement for the ACA will be written to shift the tax burden from those who have political and economic power to those who do not. 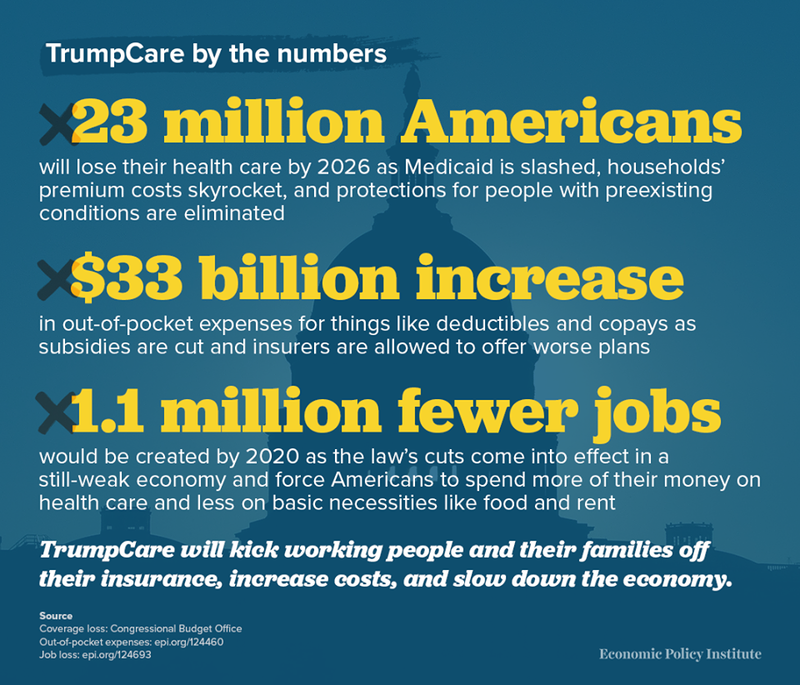 In other words, the Republicans and President Trump are redistributing income and wealth from the 99 to the 1 percent via repeal of the ACA. The Republicans are likely setting up some form of death panels by simply repealing the ACA and replacing it with something that will be underfunded. 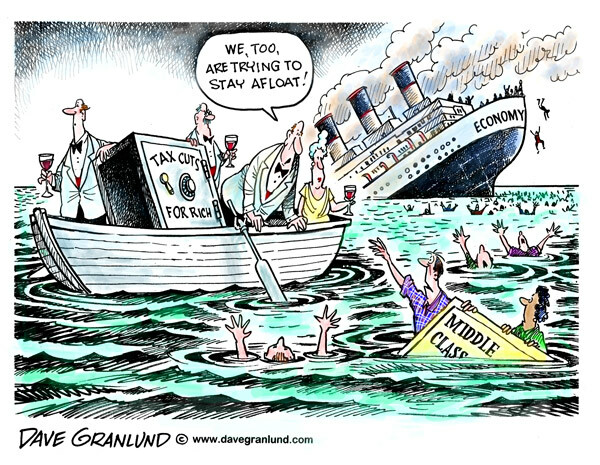 Income Inequality: Is That Why the Health Insurance Executives Wanted the Affordable Health Care Act? Notice from the graph below that the declining number of employer provided health care policies coincided with rising income inequality. In addition, more and more people could not afford to purchase individual health insurance plans. You will notice that as jobs were shipped overseas, as income was legislatively shifted to the top income earners, as real income stagnated since 1980 for 90 percent of Americans, as the health insurance industry jacked up the prices of their policies in illegal defiance of market forces, the abilities and willingness of employers to provide health care insurance as part of their employee compensation package declined. 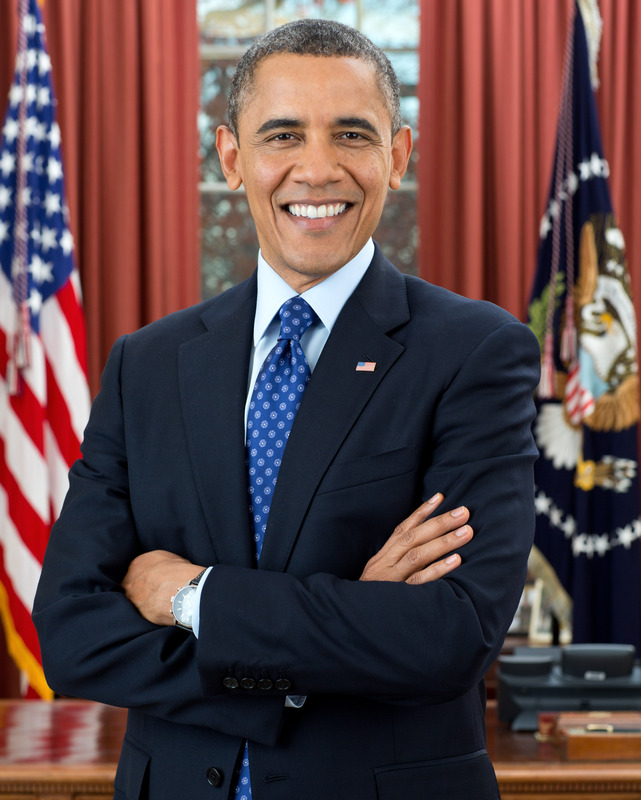 People can rightly suspect that one of primary incentives for the Obama Administration and the health insurance industry to fight for and enact the Affordable Care Act was to provide more profits to the industry via government provided subsidies that boosted profits for the industry because ncome inequality had placed tremendous financial strains of the industry. Which is why, perhaps, the health insurance executives who wrote the Affordable Care Act squashed the idea of a competitive public option off the negotiating table long before negotiations even began, and President Obama went for it. The profits of the five largest health insurance companies have risen thanks to the Affordable Health Care Act, because the number of government subsidized individual health care plans they offer has soared since 2012. This suggests that keeping profits rising with government subsidies was a major and perhaps the primary reason the health insurance industry decided to support the enactment of the Affordable Health Care Act.